We are the Dixon Family and we want to thank you for visiting our web site. We are located in Meridian, Idaho. The birth of Dixon’s Ark Ranch came with the purchase of our 1st Poodle, Pearl. She was a black standard poodle that was full of life and our family adored her. To give Pearl a bit of companionship we later purchased Sir Maximus of Freedom from Nebraska (born Sept. 11th 2001). The dogs were a joy to be with. Smart, engaging, excellent temperament with younger kids. We couldn't have asked for more in two beautiful pets. We had enough room that we felt we could add to the family so we then purchased 2 cows, 2 Boer goats, 2 Pygmy goats and 2 Suffolk sheep. The Ark was beginning to fill up, Dixon’s Ark Ranch was truly born! We purchased Espi in October 2005. We came across her, we fell in love with her. Her personality was perfect. She seemed to love all people and other animals, generally friendly to all. We purchased a breeding pair of parti colored standard poodles Rico and Aniyha in 2007. We bred parti poodles for 2 years, and then retired Aniyha to become a companion dog for the disabled. With the retirement of Aniyha we turned our focus to breeding Labradoodles only. For breeding, we use Casper and F1b Labradoodle and Sophie a Standard Poodle creating F2b pups, their puppies are 87percent poodle, 13 percent Lab. We focus on each and every pup to ensure it will be a healthy, happy part of its new family. Each pup receives individual care from birth, including hand feeding as needed to keep all pups energetic and playful. Overall we only allow each dam to have three to five litters total. This ensures she lives a happy and full life, without experiencing discomfort and health issues due to over-breeding and lack of care. When we retire a dam we find a home for her just as we would with any pup. Retired dams make an excellent choice for people with disabilities, young children, or other reasons they do not want an energetic young pup. Even Snapple thinks Labradoodles are made from "The Best stuff on Earth"
Dixon's Ark Ranch Grooming now OPEN!! "Three-year-old Adelynn Dixon, smiling, led the way to the kennels several yards from the house. “Do you want to see my dogs?” she asked. “Yes, we do,” we replied, and her smile widened. 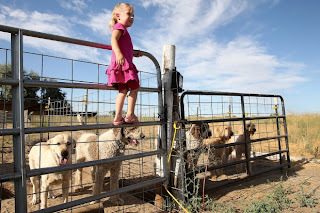 Adelynn knew the way well, because she plays with the dogs every day at her parents’ home in Jerome. There are benefits to that, said Scott Dixon. Interacting with the dogs is a good way to teach her respect for animals. It’s also a vital component in the dog-breeding process — the puppies get better socialized. Scott and his wife, Margo, raise Labradoodles — a mixed breed comprising genes from a golden Labrador and a standard poodle. Though breeding started as source for extra income, it has turned into a lifestyle the Dixons came to enjoy. What compensates for the time commitment and costs of the breeders’ lifestyle? 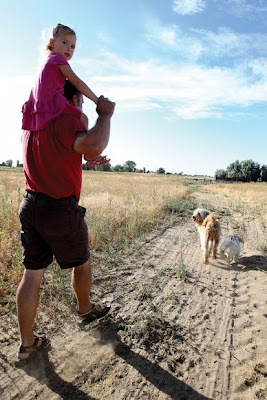 The wagging tails of the puppies, the adults’ companionship, the smiles that come easily to Adelynn’s face.